minutes, then stir in the black pepper, bay leaves and salt to taste. have softened and the tomatoes start to break apart, about 25 minutes. until you have a coarse sauce. Season again to taste. Set aside in a warm place. or 6 whole canned green chiles (Ortega®). 1. Divide the cheese into 6 mounds and roll each mound into a football-shaped ball with your hands. Slit each chile lengthwise halfway and gently stuff a ball of cheese into each. Set aside. into the whites to complete your egg batter. until a thermometer inserted reads 350º degrees. spread an equivalent amount of batter over the chile. 6. 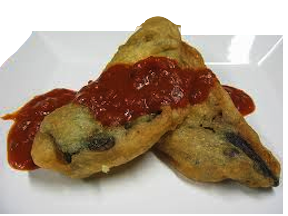 Spoon one-half cup sauce over each chile relleno and serve immediately. 15 grams saturated fat; 271 mg. cholesterol; 672 mg. sodium.